1- The European Bureau for Conscientious Objection congratulates the No for Compulsory Military Service Movement in Egypt for its impressive non-violent struggle to establish freedom and democracy. 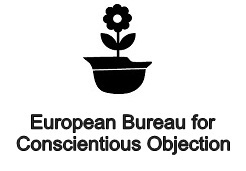 2- The European Bureau for Conscientious Objection declares solidarity with the Egyptian revolution and the demands of the Egyptian people for freedom and democracy. 3- We salute the non-violent nature of the Egyptian revolution, and we hope that non-violence becomes the tool of solving conflicts in Middle East. Winning of the Egyptian revolution is a winning of the non-violent tools used in this revolution. 4- We mourn Egyptian demonstrators who lost their lives during the campaigns calling for freedom in their country. We are sending our condolences to all of their families and friends. 5- We condemn all violent actions by Egyptian police and military (including killing, shooting, illegal arrest of activists, torturing … etc.) and we call for immediate investigations about those incidents and punishment of corrupted officers who participated in those actions. 6- We are still concerned about the continuity of the Egyptian revolution until founding a free democracy in Egypt. 7- We are standing with activists demanding for the still unsolved demands of the revolution (including a Civil State, abolishing of the State Security Department and ending of the Emergency Status). 8- We call for an immediate return of the military to their barracks, to leave political life to civilians, and to stop standing against the demands of the Egyptian people. 9- The No for compulsory Military Service Movement is grateful to everyone all over the world who acted in solidarity with the Egyptian Revolution; we consider all of them participants in our revolution. But we want them to know that our revolution hasn’t ended yet, and we still need your actions (demonstrating and writing) until the demands of the Egyptian people are achieved, and a true democracy is established in Egypt. 10- EBCO is concerned about the safety of pacifist activists in Egypt, after the military arrested twice, beat and sexually harassed Egyptian conscientious objector Maikel Nabil Sanad. Egyptian authorities should guarantee that such actions are not repeated and that those responsible are held accountable. 11- EBCO supports closer cooperation between pacifists and conscientious objectors in the Middle East leading to a youth exchange between its countries for a better mutual understanding in order to contribute to a peace process based on non-violence to abolish militarization in the region. 12- We declare solidarity with all the non-violent revolutions in Middle East. We are standing with demonstrators in Libya, Tunisia, Bahrain, Yemen, Iran, Algeria, Oman and Syria. We declare also special solidarity with Libyan soldiers who refused to kill civilians. We call for the full respect of the rights of conscientious objectors and refugees who flee to other countries or internally displaced people who move to other areas within their own country. * Selmyya is an Arabic word means “peacefully”. Egyptian demonstrators were yelling with this word every day during the revolution.